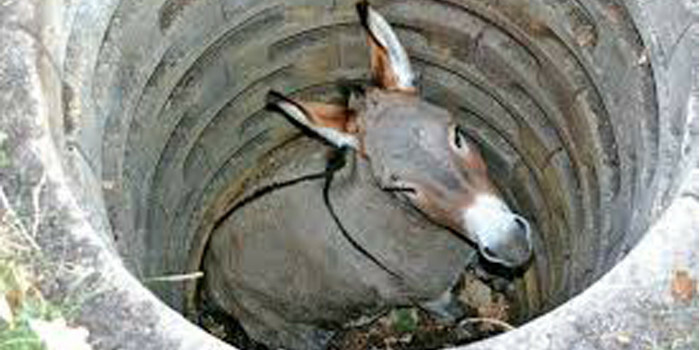 One day a farmer’s donkey fell down into a well. The animal cried piteously for hours as the farmer tried to figure out what to do. Finally he decided the animal was old and the well needed to be closed. It just wasn’t worth the effort to retrieve the donkey. He invited all his neighbors to come over and help him. They all grabbed a shovel and began to shovel dirt into the well. At first, the donkey realized what was happening and cried horribly. Then to everyone’s amazement, he quieted down. As the farmer’s neighbors continued to shovel dirt on top of the animal, he would shake it off and take a step up. Pretty soon, everyone was amazed as the donkey step up over the edge of the well and happily trotted off. LESSON: Life is going to shovel dirt on you, all kinds of dirt. The trick to getting out of the well is to shake it off and take a step up. Each trouble or issue is a stepping stone. We can get out of the deepest wells just by not stopping and never giving up! Shake it off and take a step up.